Great importance of ties with Canada. Allies in NATO; economic partners based on trade relations and investment. Hungary 50 years after the Hungarian Revolution of 1956. Hungary as beholden to Canada for admitting 40,000 refugees who escaped from the communist dictatorship in 1956. The peaceful transition in 1989. Transition and democratization in the 1990s. Some facts and figures about Hungary then and now. Economic and trade ties between Hungary and Canada. Capital investments in Hungary from Canadian investors. Possibilities to increase these investments and expand them into other areas. Some suggestions for doing so. The one issue casting a shadow over our otherwise excellent relations. Future political, diplomatic and economic cooperation. "Here is the time, now or never! This is the question, answer! We swear to be slaves no more!" These are the valiant words that rallied a people to freedom. The Hungarian people know well the promise and price of freedom. Many living today lived through the long terrifying nightmare of fascism, or communism, and some lived through both. Yet the Hungarian people never lost hope for a better tomorrow. They kept the flame of faith alive as they sought and fought for freedom. And 50 years after they watched the Soviets invade their beloved homeland, they now freely watch as their grandchildren play in the fields like all other grandparents do in free and democratic countries throughout the world--without concern for life or limb. Freedom though, is never free; it costs. And it cost the Hungarian people greatly. Yet, it is a price found to be worth paying. This has been the experience of the Hungarian people. For in the end, a life of liberty can be delayed, but it can never be forever denied. His Excellency Laszlo S—lyom is one who understands this intimately. The Hungarian National Assembly (Parliament) elected Laszlo Solyom, the former chief justice of the Constitutional Court, as the new President of the Republic of Hungary on June 7, 2005. His Excellency, who is not a member of any party, took the oath of office immediately after the vote in a formal ceremony in Parliament. His Excellency was the first chief justice of the Hungarian Constitutional Court between 1990 and 1998. He was also a member of the "Opposition Roundtable," which in the late 1980s took part in talks with the then-ruling Communist Party and helped set the ground rules of the transition to democracy. In 1998 he was awarded the Grand Cross with Star of the Order of Merit of the Federal Republic of Germany. In 1999 he was awarded the Grand Cross of the Order of Merit of the Republic of Hungary. In 2003 he received the medal of the Nagy Imre Order of Merit. Will you please greet with me His Excellency Laszlo Solyom, President of the Republic of Hungary. 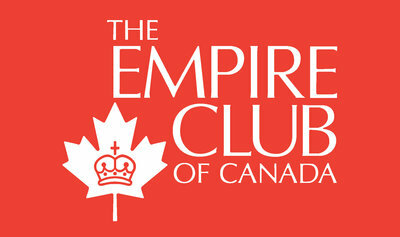 Mr. President, ladies and gentlemen, first of all let me thank the Empire Club of Canada for your kind invitation. I am delighted to be here today to talk about the relationship between Canada and Hungary, about events 50 years ago that brought our nations closer together, and finally the present economic situation in Hungary. We attach great importance to our ties with Canada. Our bilateral relations are free of any problems. We are political and military allies on the basis of our NATO membership and economic partners based on trade relations and investments. My visit takes place after the celebration of the 50th anniversary of the Hungarian Revolution of '56 that forged personal ties between our two countries as early as half a century ago. Hungary is beholden to Canada for admitting 40,000 refugees who escaped from the communist dictatorship in 1956. Those people had left their homeland without any hope and found a new country, a new home in Canada. This is the reason why I express my appreciation to the government of that time led by Prime Minister Louis St. Laurent for admitting a considerable number of refugees. Special acknowledgement is given to the then-Minister of Immigration John Pickersgill since it was largely due to his personal support and assiduous work that Canada became one of the major host countries providing shelter for Hungarian refugees. Canada's leaders have certainly realized that the Hungarian Revolution was not only the cause of Hungary but that of the whole world. Despite all the victims and all the suffering the revolution was not in vain. The revolution and freedom fighters of 1956 shook the Soviet block to its foundations and the peaceful transition in 1989 can be traced back to this historic event. The transition and democratization that took place at the beginning of the nineties was not as rapid as many had hoped, but Hungary developed a model for democratic foundations and political stability based on its constitution. It was the only post-communist country where Parliament served the full term. We have never had early elections. I should like to add that according to international literature Hungary is one of the countries where the constitutional accord played a decisive role in its democratization and is a model for other countries. Ten years ago a university selected countries with the most significant constitutional accords in the world and invited them to a global constitutional seminar. I was delighted to attend that event, together with representatives from the Canadian Supreme Court. Today Hungary has become one of the rare functioning democracies and market economies of our region. The economies of Hungary and Canada are functioning well and we share the same values. Hungary became a member of NATO in 1999 and in 2004 it joined the European Union as well. Following the social and political changes in Hungary, economic and trade co-operation between our countries grew stronger. Canadian capital investments in Hungary of about US$2 billion played an outstanding role in this. The biggest investments were made in real estate development, but Canadian investors are present in almost all spheres of the Hungarian economy. Firms such as Xenon, Bombardier, ATCO, Rio Algom, First Hungary Fund, Cineplex Odeon, and CNS Lavalin have all set up manufacturing plants in Hungary. Given the enormous economic strengths of Canada there are certainly other possibilities to increase these investments and to expand them to other areas as well. The fact that Hungary is an attractive target for investors is reflected by the numbers. In 2006 some US$6.1 billion worth of foreign direct investments (FDIs) arrived in Hungary and my country is still ahead of others in the region in terms of FDI per capita. Hungary offers an outstanding economic climate as a basis for further developing relations. In 2006, Hungary's GDP grew 3.9 per cent. The government is carrying out measures to balance the national budget. As growth is driven mostly by exports namely by the two-digit expansion of industrial exports, the 11.9 per cent increase in productivity in 2006 is an important indicator. Hungary is still number one in the region in terms of unit labour cost. Thanks to our favoured geographical location, Hungary functions as a bridge between east and west. Hungary has skilled, creative workers. However, for investors utilizing the potential of the Hungarian market, it may not be the only consideration. Hungary may serve as an excellent base for their business plans because of the untapped economic potential of the south-eastern and eastern European region. The government has other incentives to make Hungary even more attractive for foreign investors such as tax breaks, EU funds, and government subsidies awarded to major investors on a case-by-case basis. Hungary attaches great importance to ideas that promote trade going beyond the traditional bilateral format, for instance in the fields of research and technology development or regional possibilities within the EU. Considering the economies of Hungary and Canada, we see an excellent opportunity for strengthening the ties between our two countries in the fields of information technology, telecommunications, the pharmaceutical industry or even mining. The volume of trade between Hungary and Canada is very modest but has a chance of growth. Last year for the first time in many years our exports to Canada grew much more than that of Canada to Hungary. We would like to further expand our exports in the IT sector and through the exports of Canadian firms settled in Hungary in the car equipment and subway industries or by the promotion of typical Hungarian products. In closing please allow me to say a few words about the one issue casting a shadow over our otherwise excellent relations. There is an irregularity in the travel requirements of our respective citizens. As Hungarians we still need a visa for travel to Canada. We believe that the situation is not commensurate with our excellent relations and long-standing partnership as allies. The conditions, that necessitated the imposition of a visa requirement for Hungarian citizens in 2001, have changed considerably, due partly to our membership in the EU. Hungarian travellers pose no security risks to Canada. It is clear that the settlement of this issue requires political decisions. I would like to use my stay here to request my Canadian hosts to lend their support to the resolution of this problem. I hope that our future political, diplomatic and economic co-operation will be enhanced by this state visit and we will have favourable results both for Canada and Hungary. Thank you for your kind attention. The appreciation of the meeting was expressed by Bart Mindszenthy, APR, Fellow CPRS, Partner, Mindszenthy & Roberts Corp., and Past President, The Empire Club of Canada.